In the simple world that predated cybercriminal attacks, stateful firewalls were the only network defense an organization needed for protection. Today's potential security hazards require the protection of Unified Threat Management (UTM), the gateway security solution that has evolved along with the rise of enterprise security threats. 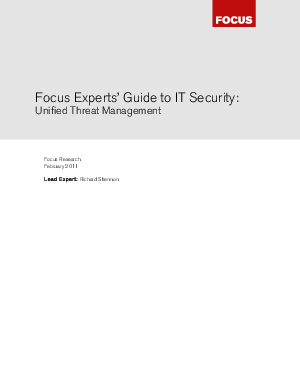 This Focus Experts' Guide to Unified Threat Management introduces the primary vendor solutions along with decision factors that must be considered when selecting a product to provide network defense.